लक्ष्मीLakshmi is the Goddess of wealth, prosperity (both material and spiritual), light, wisdom, fortune, fertility, generosity and courage; and the embodiment of beauty, grace and charm. Representations of Lakshmi are also found in Jain monuments. Also called Mahalakshmi, She is said to bring good luck, and is believed to protect Her devotees from all kinds of misery and money-related sorrows. Lakshmi in Sanskrit is derived from its elemental form lakS, meaning "to perceive or observe". This is synonymous with lakṣya, meaning "aim" or "objective". The sacred texts, the Vedas call Mahalakshmi as Lakshyayidhi Lakshmihi which means She is the one who has the object and aim of uplifting mankind. Shring is the Lakshmi bija. The prescribed number for japa is 100.000. 10.000 ahutis of ghee and samigri bring Mother lakshmi's blessings in the form of peace, prosperity and harmony. The Lakshmi Gayatri is a potent mantra to achieve wealth and success. The constant sravana (attentive hearing) of the mantra as rendered by traditional pandits in this album. Lakshmi is the Hindu Goddess who governs all forms of wealth and success and the paths, means and results to all forms of Prosperity. Mother Lakshmi is often depicted in several colors: Pink, Gold and White. When Lakshmi’s skin color is Pink, She is the Divine Mother. When Her skin is Gold, She is the Universal Shakti and when Her skin is white, She is Mother Earth. As the the Consort of Lord Vishnu (Narayana), who is the God of Preservation, Lakshmi Devi is the Goddess of Health and Beauty. Sri Lakshmi embodies Sublime Beauty, Siddhi, Peace, Strength, Balance, Auspiciousness, Opulance and Wisdom. Because Lakshmi possesses all of these good and noble qualities, She embodies infinite wealth~ symbolizing that good and noble qualities are the only wealth we can keep. Lakshmi Devi is always depicted sitting or standing on a lotus with golden coins flowing in an endless stream from one of her hands~ symbolic of when the lotus of wisdom blossoms, the wealth of good and noble qualities appears and Lakshmi’s blessings are present. It is for our Divine Mother, Sri Lakshmi, for whom this webpage is dedicated. Enjoy and much Peace to you! Prakruti - Nature. Goddess Lakshmi is nature, the centre of all, the manifested and the unmanifested. Vikruti - Multi-Faceted Nature. Attributed with a multi-faceted nature, Goddess Lakshmi assumes many forms, known by numerous names, yet is attributeless. Vidya - Wisdom. Goddess Lakshmi is the inward movement of Consciousness toward liberation of the Ultimate. Sarvabhootahitaprada - Granter of Universal Niceties. All sensual pleasures are dependent upon the grace of Goddess Lakshmi only. As a repositary of knowledge and wisdom, She personifies pleasantries and blesses her devotees with goodness. Shraddha - Devoted. The Goddess, who is realised devotion, is ever found of Her devotees, By one’s devotion, one can grasp the Ultimate Reality. Vibhuti - Wealth. Goddess Lakshmi, bestowing wealth and happiness on Her true followers, is the eternal source of bliss and joy, whose divine grace and benevolence on Her devotees bring joy to them. Surabhi - Celestial Being. The Goddess, who is the supreme forum, is also a celestial Being. She is worshipped by the Highest, the Trimurthis. Paramatmika - Omnipresence. Goddess Lakshmi is the Supreme Goddess of the three worlds and is the sole shelter for the distressed and the destitude. Vachi - Nectar-Like Speech. Goddess Lakshmi, the graceful and beautiful Goddess, is attributed with speech like nectar, sweeter in melody than the nectar, or even the music of the veena. Padmalaya - Residing On The Lotus. Emerging from the ocean of Milk and Nectar, the Divine Goddess has her abode in the lotus, which is a shelter of bliss and happiness. Padma - Lotus. Emerging from the Ocean of Milk, seated on lotus, Goddess Lakshmi is also called Padma. She adores the lotus flower, and is Herself like one, tender, supple and graceful. Shuchi - Embodiment of Purity. Attributed with virtues of compassion, kindness, love, benevolence and mercy, among other things, the gracious Supreme Goddess is the symbolic representation of purity. Swaha - Shape of Swahadevi(Auspicious). Goddess Lakshmi embodies all that is held auspicious. Her grace and blessings ensure all comforts and bestow fruits of labour and true devotion, for she is the source of all that is good and auspicious. Swadha - Shape of Swadhadevi (Inauspicious). Bestowed with auspiciousness and sacred attributes, Goddess Lakshmi spells doom for those vilolating universal laws, becoming a sign of inauspiciousness for them. Sudha - Nectar. The beneficent, most endearing and lovable Goddess Lakshmi dwells in everybody as nectar, as the source of all bliss and enjoyment. She is effulgent with kindness and as sweet and charming as honey. Dhanya - Personification of Gratitude. The most benevolent, the most compassionate, the most endearing-with these attributes, Goddess Lakshmi dwells in everybody as the source of all bliss and enjoyment, for She is Gratitude Personified. Hiranmayi - Golden Appearance. Like a thousand suns, Goddess Lakshmi radiates splendour. Resplendent in all Her glory, She is dazzling like lightening, and cool as the silvery moon. Lakshmi - Goddess of Wealth. Goddess Lakshmi is the source of all powers and energies, dazzling in all Her glory. NityaPushta - Gaining strength Day By Day. She is the greatest strength, the greatest intelligence and the greatest bliss. By concentrating on Her, one can grow stronger day by day. Vibha - Radiant. The great Goddess of wealth, Lakshmi is a limitless ocean of beauty, whose spectacular appearance overwhelms the mind. She shines in all her glory and beauty of form. Aditi - Radiant Like The Sun. The beautiful, graceful, eternally radiant and smiling Goddess Lakshmi is the centre of beauty, the source of beauty. Seeing her beauty, even a thousand Kamadenus feel belittled. Deetya - Answer Of Prayers. Quickly dispelling all afflictions and fears, the beautiful Goddess protects Her beloved ones as an answer to their prayers. Deepta - Flame-Like. The gracious Goddess, most beautiful and graceful, shines with radiance, like a thousand suns brilliance. Vasudha - Earth. As Goddess of Earth, Goddess Lakshmi bestows Her grace and love on her worshippers. Anyone seeking shelter in Her will be blessed. Vasudharini - Bearer of the Burden of Earth. Mother Lakshmi, who quickly dispels all afflictions, is the Supreme Goddess of Earth. She protects her loved ones and showers Her grace and blessings on them, by bearing and taking upon Herself their burden. Kamala - Lotus. Although attributeless, Goddess Lakshmi has a lotus like face, eyes, hands and feet which carry their fragrance far and wide. Like the nectar in the lotus, She is ever sweet and endearing. Kantha - Consort of Vishnu. As the beloved consort of Lord Vishnu, Goddess Lakshmi is the light of the universe, and its Infinite Existence. Kamakshi - One with Attractive Eyes. The eternally beautiful Goddess Lakshmi is loved by all the gods. Her eyes, radiating love and compassion, dazzle with the knowledge and wisdom of infinite power which the gods recognise as Ultimate Reality. Kamalasambhava - Emanating from the Lotus. Goddess Lakshmi’s emergence out of the powerful and waveless Ocean of Milk and Nectar is significant, for She is without attributes, changless, yet the cause of all changes. Anugrahaprada - Granter of Good Wishes. The ever-benevolent Goddess Lakshmi is the bestower of all kinds of comforts to her devotees, granting them her grace, her blessings, and shelter. Buddhi - Wisdom. She is self-luminous, i.e., illuminates the senses, thereby dispelling ignorance. Anagha - Sinless. She is untainted, pure Consciousness. By mere concentration on Her, every sin becomes a virtue. Harivallabhi - Consort of Lord Hari. As Hari’s beloved, Goddess Lakshmi is His consort, and takes various forms when He manifests in the human form. She is the power of knowledge and the abode of all gods. Ashoka - Dispeller of Sorrows. 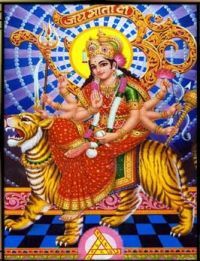 Armed with all the tools of destruction, the Supreme Goddess dispels all sorrows and vanquishes evil. She dispels the fear of Her devotees by destroying evil and ensuring peace to prevail. Amrutha - Nectar. The Goddess is the quintessence of nectar. The devotee feels incomparable bliss when he surrenders himself totally, transcending his ego. Deepa - Radiant. The radiance emanating from Goddess Lakshmi overwhelms the mind of even Her beloved. Ever shining and replendent in all her jewellary, she exudes charm and magnetism. Lakashokavinashini - Remover of Universal Agonies. Without Goddess Lakshmi’s grace, it is impossible to accomplish any sacrificial rite or big mission. By surrendering unto her, one can be relieved of one’s agonies and distress. Dharmanilaya - Establisher of Eternal Law. The great, ever-forgiving Goddess Lakshmi stays with dharma, staying when one leads a pious life, devoid of any immoral activities. The devotee is blessed with the grace of Goddess Lakshmi and absolved of all sins. Karuna - Compassionate. As Mother of the universe, Goddess Lakshmi is the ocean of compassion and love. She is the embodiment of peace, praised by the gods, and giver of every wealth that is sought. Lokamatri - Mother of the Universe. There is no end to Her immense power. Her glory is so great as to be beyond description. As mother of the universe she commands the admiration and reverence of the gods and other beings. Padmapriya - Lover of Lotus. Goddess Lakshmi, seated on a lotus and emerging from the ocean of milk, is extremely fond of the flower. Her garland of lotuses is significant in that her beauty transcends all. Padmahasta - Having Lotus-Like Hands. Goddess Lakshmi is attributed with hands that are soft and gentle like the petals of the lotus. They sparkle with ornaments that are studded with precious stones. Padmakshya - Lotus-eyed. Her lotus-like eyes are full of divine love and gentleness. As a source of bliss and limitless happiness, the supreme Goddess radiates kindness and compassion, and infinite power and wisdom. Padmasundari - Beautiful Like the Lotus. Radiant and glowing as she is, Goddess Lakshmi is as slender and beautiful as a lotus stalk. Like the nectar in it, She is attractive, and extremely graceful like a deer. Padmodbhava - One Who Emerged Out of the Lotus. When the ocean of Milk was churned, the great, divine Goddess emerged out of the lotus, and looked so beautiful that everyone sang her praises. Padmamukhi - Lotus-Faced. Goddess Lakshmi, gentle and beautiful like the lotus flower, is benevolence personified. With her lotus- like face, she is the source of all speech. Padmanabhapriya - Beloved of Padmanabha. Padmanabha, another name of Lord Vishnu, is consciousness, and his power is Lakshmi, his beloved consort. There is no distinction between them. Ramaa - Pleaser of the Lord. As Ramaa, Goddess Lakshmi roams the three worlds, keeping a watchful eye on Her faithful devotees, and showering on them her grace and blessings. Padmamaladhara - Wearer of Lotus Garland. Bedecked with a garland of ltuses, the graceful Goddess is the queen of the universe, moving and non- moving. Since she emanates from the lotus, she is fond of the flower. Devi - Goddess. Goddess Lakshmi is beyond comparison. Her glory is ineffable, incomparable and endless. She is the supreme, the ultimate reality, without form, yet creating forms. Padmini - Lotus. The beloved Daughter of the Ocean of Milk, emerging from the waters on a lotus, is the granter of divine bliss. Like the lotus, she personifies beauty and tenderness. Padmagandhini - Having the Fragrance of the Lotus. The Great Goddess, emerging from the lotus, has the fragrance of the lotus, the appearance of the lotus and its tenderness. Punyagandha - Having Divine Perfume. The beautiful and gracious Goddess engulfs the whole universe with her being and divine fragrance. Her lotus-like appearance exudes a heavenly perfume that pervades everywhere. Suprasanna - Ever Cheerful and Beaming. The Supreme Goddess, ever beautiful and radiant in all her splendour, is the embodiment of loveliness, grace and charm, compassion and love, power and infinity. She is ever cheerful, a smile playing on her lips. Prasadabhimukhi - Emerging to Grant Boons. He who worships Goddess Lakshmi with full faith in his heart gets the desired boon and attains perfection, for she is ever ready to fulfil the wishes of her devotees. Prabha - Radiant Like the Sun. Fond of the golden hue, Goddess Lakshmi is always reflecting the radiance in her sparkle, like a thousand brilliant suns. Chandravadana - Moon-Faced. Goddess Lakshmi is likened to the moon in appearance and in coolness. She is a virtue of goodness, raining the quintessence of nectar on her worshippers. Chanda - Cool Like the moon. The moon-faced Goddess Lakshmi is always cool and calm like the moon and is ever endearing. She is the embodiment of all the aspirations of a peace-loving man. Chandrasahodari - Sister of the Moon. Goddess Lakshmi is considered to be the moon’s sister, for both emerged out of the Ocean of Milk when it was churned by the gods. Her appearance is radiant like the moon. Chaturbhuja - Four-Shouldered. The Almighty Goddess Lakshmi is attributed with four shoulders, and in each of her arms She carries something which is symbolic. She is Infinite Power. Chandrarupa - Moon-Faced. The ever-radiant, beautiful Goddess Lakshmi, with her moon-like face, reflects the cool, silvery luminiscence of the moon. She is the personification of virtues. Indira - Radiant like the Sun. Seated on a golden throne in the Ocean of Nectar, she shines with the brilliance of a thousand rising suns. Indusheetala - Cool like the Moon. Goddess Lakshmi, though radiating from the heart of the sun, is cool like the moon. She is the power that goads our minds, which are conditioned by various limitations, to free ourselves from sins. Ahladajanani - Source of Happiness. The benevolent Goddess Lakshmi rules the entire universe, and its laws and its execution, bringing joy and happiness to her haithful devotees. She is the personification of divine bliss. Pushti - Healthy. Full of the bliss of youth, the Goddess is tender but at the same time to bouncing with good health. Shiva - Auspicious. The beautiful Goddess, radiant and dazzling like a thousand suns, portends all that is auspicious, for She embodies Primordial Energy. Shivakari - Source of Auspicious Things. Goddess Lakshmi, embodying auspiciousness, is the Primordial Energy invoked by devotees for their well- being. Satya - Totality of Truth. The powerfull Goddess Lakshmi, as Satya, is the ultimate reward of any endeavour that is undertaken with true faith. She is the ultimate reality, and anyone who recognises this Truth, is blessed with her grace. Vimala - Pure. The most benevolent, the most loving, the most powerful, Goddess Lakshmi is the mine of all virtues, as pure as the best gems. Vishwajanani - Mother of the Universe. Mother Lakshmi, the ever benevolent, the compassionate, loving, forgiving Goddess, who is ever protective towards her loved ones, is the source of all happiness and virtues. Pushti - Possessor of All Wealth. A true devotee get immense riches and happiness, and never suffers privation, for the most benevolent Goddess Lakshmi is the possessor of all wealthand is bounteous. Daridriyanashini - Remover of Poverty. By her Glory, Goddess Lakshmi procures for her devoted ones every kind of wealth and prosperity, thus removing their poverty. Preeta Pushkarini - One with Pleasing Eyes. In the ocean of her beauty, Goddess Lakshmi’s eyes are gentle and pleasing. They are ever watchful, seeing everything, and are full of compassion and divine love. Shanta - Peaceful or Calm. Ecstatic with a smiling face, as a sign of Her inner bliss, she shines with the seven colours of the rainbow, just as a peacock dances with pleasure at the sight of clouds, even so, she makes the minds of devotees dance with bliss, dispelling troubled thoughts. Shuklamalambara - Wearer of White Garland and Attire. On emerging from the Ocean of Milk, seated on a lotus, she looked so radiant and beautiful that the great ocean gave her a garland of imperishable white flowers. Replendent in a white garland and attire, She personifies purity. Bhaskari - Radiant like the Sun. Goddess Lakshmi’s entire image is dazzling, for She is the mine of all virtues, shining like gems and precious stones. Her beauty is beyond comparison in the three worlds. Bilvanilaya - Resider Under Bilva Tree. Goddess Lakshmi, Mother Nature in her pristine form, resided under the bilva tree, whose leaves are offered as worship to the gods. Vararoha - Ready to Offer Boons. Resplendent in all her glory, she is ever compassionate and benevolent, always ready to offer boons to the virtuous. Yashaswini - Reputed. 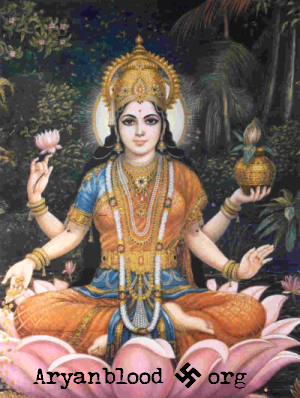 The Supreme Goddess, splender and beautiful like a lotus, is reputed to be the embodiment of Highest knowledge and Ultimate Reality. Vasundhara - Daughter of the Earth. Goddess Lakshmi, Daughter of the Earth, creates, preserves and destroys the universe for her own pleasure. She is changeless, yet is the cause of all changes. Udaranga - Endowed with a Beautiful Body. Goddess Lakshmi is not only the Goddess of wealth but also of beauty. She dazzles in all her splendour, exuding charm and grace, and is the focus of all admiration. Harini - Deer-Like. Although attributeless, Goddess Lakshmi assumes the most beautiful form, and like a deer, is ever graceful and gentle. Hemamalini - Having Golden Garlands. The beautiful Goddess, having emerged from the Ocean of Milk on a lotus flower, is ever fond of wearing the golden flower garlands that bedeck her bosom supremely. Dhanadhanyaki - Bestower of Wealth and Foodgrains. Goddess Lakshmi, symbolic of wealth and prosperity, is also the Goddess of foodgrains. She fulfils the desires of the ever-faithful and showers her grace on them. Siddhi - Ever Ready to Protect. The great Supreme Goddess is always ready to protect anyone who seeks her blessings and grace. She is benevolent, compassionate, forgiving and loving. Straina Soumya - Showering Goodness on Women. The compassionate, loving mother of the world is Goddess Lakshmi. She provides succour to her loved ones, especially women, showering her divine grace on them. Shubhaprada - Granter of Auspicious Things. The auspicious and bebevolent Goddess Lakshmi makes everyone affluent with all kinds of riches. She is the treasury, the fountainhead from which flows the material that the universe is built of. Nrupaveshvagathananda - Loves to Live in Palaces. Goddess Lakshmi, the embodiment of wealth, power and knowledge, loves to dwell in palaces, meaning that she resides in those who are large-hearted, for she herself is most bountiful. Varalakshmi - Granter of Bounty. Goddess Lakshmi is the repository of all virtues. She is ever bountiful and compassionate, bestowing all kinds of riches and happiness on whoever worships her truly. Vasuprada - Bestower of Wealth. All virtues are embedded in the virtuous Goddess Lakshmi, and by her grace, one accomplishes one’s desire. She is the personification of benevolence and bestows lavishly. Shubha - Auspicious. Goddess Lakshmi, also called Shubha, is the harbinger of good auspices, for she is full of bliss and good vitues, worshipped by all, loved by all, aven by the gods. Endowed with everthing auspicious she spells success and prosperity. Hiranyapraka - Amidst Gold. The great Goddess, with her gracious and radiant experience, stands out amidst the glittering gold-like rays of a thousand suns. Samudratanaya - Beloved Daughter of the Ocean of Milk. When the Ocean of Milk was churnes, there emerged fourteen gems. Emerging out of it as one of them, Goddess Lakshmi chose Lord Vishnu’s companionship for ever. Jaya - Goddess of Victory. As the triumphant victor, Goddess Lakshmi is the element of success in all actions, pervading the three worlds with her faultness brillance. She is Supreme, she is Omniscient. Mangala - Most Auspicious. Goddess Lakshmi is the source of all that is good and auspicious. She is the harbinger of good auspisces. Devi - The Deity. She is pure Consciousness, unformulated or undifferentiated. Unsupported, she is the support of the universe. Vishnuvakshah - Residing in Vishnu’s Chect. Residing in the chest of Lord Vishnu, Goddess Lakshmi worships and adores het consort. They are the two aspects of the Ultimate reality. Vishnupatni - Consort of Vishnu. When Goddess Lakshmi emerged from the Ocean of Milk, Lord Vishnu chose her as his consort. She is the Darling of the three worlds, being gentle, loving, benevolent and beautiful. Prasannakshi - Lively-Eyed. Goddess Lakshmi, whose eyes are like lotus petals, who is gold-hued, who has in her hand a lotus flower, is soft and gentle like the lotus stem, and she showers her loved ones with her blessings. Narayana Samashrita - Sought Refuge in Narayana. Goddess Lakshmi, the beloved consort of Vishnu, sought refuge in his chest after emerging from the lotus. The great Lord Vishnu is the power that sustains the world, and Goddess Lakshmi represents the inherent energy in that power. Daridriya Dhwamsini - Destroyer of Poverty. Being a treasure of Kindness, the great Goddess dispels all ignorance, and eliminates poverty. she is the personification of Kindness and benevolence. Devi - Goddess. The gracious Goddess is the darling Daughter of the entire universe. Even luminaries like the sun and the moon, and the gods and mortals worship her devotedly. Sarvapadravanivarini - Dispeller of all Distresses. The primordial power of the ultimate being the focal point of everything we experience, Goddess Lakshmi is full compassion and out of love for her devotees, she relieves them of all their distresses. Navadurga - All Nine Forms of Durga. The Omniscient, most powerful Goddess, assumes all the nine forms of Goddess Durga, for Goddess Lakshmi is Durga, Lakshmi, i.e., the Ultimate form of reality. Mahakali - A Form of Kali. Goddess Lakshmi, armed with many radiant weapons in all her eighteen hands, is also Mahakali, the vanquisher of the demon Mahishasura. Brahma-Vishnu-Shivatmika - Trinity of Brahma-Vishnu-Shiva The Supreme Goddess, the cause of all changes and creation, is the Mistress of all three worlds. Even Shiva, Vshnu and Brahma revere Her, for she is the beloved of all. Trikalagyanasampanna - Aware of the Past, Present and Future. Pure as the rain-drenced sky, charming and untouched by impurity, Goddess Lakshmi is aware of the happenings of the past, the present and the future. Bhuvaneshwarya - Supreme Deity As ruler of the whole universe, Goddess Lakshmi holds a pitcher of nectar in one hand, and in the other, a bell constantly ringing - these proclaim her victory. She is ever victorious. Sri - She who is married to Vishnu. Lakshmi is often represented in sculpture seated on a lotus, full-breasted and broad hipped, beneficently smiling and sometimes being anointed by a pair of elephants. Her vehicle is a white owl. She has no fierce form. Mother Lakshmi is the One who bestows the 16 types of wealth:(1) Fame; (2) Knowledge; (3) Courage and Strength; (4) Victory; (5) Good Children; (6) Valor; (7) Gold, Gems and Other Valuables; (8) Grains in abundance; (9) Happiness; (10) Bliss; (11) Intelligence; (12) Beauty; (13) Higher Aim, High Thinking and Higher Meditation; (14) Morality and Ethics; (15) Good Health; (16) Long Life. As a female counterpart of Lord Vishnu, Mata Lakshmi is also called ‘shri’, the female energy of the Supreme Being. Goddess Lakshmi means “Good Luck” to Hindus. The word ‘Lakshmi’ is derived from the Sanskrit word ‘Laksya’, meaning ‘aim’ or ‘goal’, and she is the goddess of wealth and prosperity, both material and spiritual. Also ‘lakh’ which means ‘one hundred thousand’ as a monetary unit in India, is the first part of Lakshmi’s name~ symbolizing her blessings that pour forth abundantly. Lakshmi is the household goddess of most Hindu families and a favorite of women. Although she is worshipped daily, the festive month of October is Lakshmi’s special month. Lakshmi Puja is celebrated on the full moon night of Kojagari Purnima. Fridays are considered auspicious for Lakshmi Puja. The Friday before the full moon in the Hindu month of Sraavan is considered specially sacred and Varalakshmi puja (puja for boons and longevity) is performed on that day by ladies in the temples and in the homes. Diwaali, the festival of lights, is also an occasion for Lakshmi Puja. Three days during Navarathri are also celebrated for Lakshmi. On the full moon night following Dusshera or Durga Puja, Hindus worship Lakshmi ceremonially at home, pray for her blessings, and invite neighbors to attend the puja. It is believed that on this full moon night the goddess herself visits the homes and replenishes the inhabitants with wealth. A special worship is also offered to Lakshmi on the auspicious Diwali night. Year after year we have seen the lamps being lit for Diwali, the birth day and the wedding day of Goddess Lakshmi. In the dark night the glowing flames herald the advent of longer nights and the early days of an Indian winter. Lakshmi is worshipped along with the beloved, pot-bellied, elephant-headed, auspicious God, Sri Ganesha. Ganesha, Lakshmi and Saraswati usually are always shown together, symbolizing that Wealth must be accompanied by Intellect and Humility. (1) Adi Lakshmi: Mother Lakshmi resides with Lord Narayana in Vaikuntha, the abode of Lord Narayana. She is known as Rama, which means bringing happiness to the mankind. She is also known as Indira (who holds lotus or purity). In this form, Laxshmi is normally seen serving Sri Narayana. Lord Narayana is omnipresent. Adi Lakshmi or Rama Lakshmi serving Sri Narayana is symbolic of her serving the whole creation. Adi Lakshmi and Narayana are not two different entities but one only. Lakshmi is Shakti. Lakshmi is the Power of Narayana. (2) Dhanya Lakshmi: Dhanya means grains. Lakshmi is the Goddess of the Harvest and the Devi who blesses with abundance and success in harvest. Harvest is a time of abundance after a long period of patience and tending to fields. This symbolizes the inner harvest, that, with patience and persistence, we obtain the abundance of inner Joy through the blessing of Dhanya Lakshmi. (3) Dhairya Lakshmi: This form of mother Lakshmi grants the boon of infinite courage and strength. Those, who are in tune with infinite inner power, are always bound to have victory. Those who worship mother Dhairya Lakshmi lead a life with tremendous patience and inner stability. (4) Gaja Lakshmi: In the holy book of Srimad Bhagavata the story of the churning of the ocean by Gods and demons is explained in detail. Sage Vyasa writes that Lakshmi came out of the ocean during the churning of the ocean (Samudra Manthan). So she is known as a daughter of the ocean. She came out of the ocean sitting on a full-bloomed lotus and also having lotus flowers in both hands with two elephants by her sides holding beautiful vessels. (5) Santan Lakshmi: In the family life, the children are the greatest treasure. Those who worship this particular form of Sri Lakshmi, known as a Santan Lakshmi, are bestowed with the grace of mother Lakshmi and have wealth in the form of desirable children with good health and a long life. (6) Vijay Lakshmi: Vijay is victory. Vijay is to get success in all undertakings and all different facets of life. Vijay is to conquer the lower nature. Hence those, with grace of mother Vijay Lakshmi, have victory everywhere, at all time, in all conditions. Victory to Vijay Lakshmi! (7) Dhana Lakshmi: Dhana is wealth. Wealth comes in many forms: Nature, Love, Peace, Health, Prosperity, Luck, Virtues, Family, Food, Land, Water, Will Power, Intellect, Character, etc. With the grace of mother Dhana Lakshmi we will get all these in abundance. (8) Vidya Lakshmi: Vidya is education. Serenity, Regularity, Absence of Vanity, Sincerity, Simplicity, Veracity, Equanimity, Fixity, Non-irritability, Adaptability Humility, Tenacity, Integrity, Nobility, Magnanimity, Charity, Generosity and Purity are the eighteen qualities imbibed through proper education that only can give immortality. Listen to Ashtalakshmi Stotram with Lyrics by Lalitha Sagari - Most Powerful Mantra Chanting. Ashta Lakshmi Stotram, also spelled Ashtalakshmi or Astha Lakshmi Stotra or Asthalakshmi, is one of the great devotional prayer addressed to the Asta Lakshmi or the Eight Lakshmis. Ashtalakshmis are regarded as the secondary manifestations of Goddess Lakshmi Devi. Astha Lakshmis are the 8 Goddess Lakshmi who are the goddesses of eight sources of wealth. Diwali and different pujas go hand in hand. Most of these pujas, like Ganesh and Laxmi have aarti associated with them. 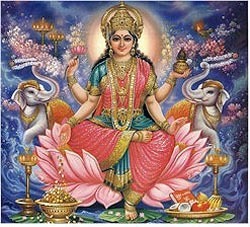 Lakshmi or Laxmi, is the Hindu goddess of wealth, fortune and prosperity. She is the wife and shakti (energy) of Vishnu, one of the principal deities of Hinduism and the Supreme Being in the Vaishnavism Tradition. Lakshmi is also an important deity in Jainism and found in Jain temples. Lakshmi has also been a goddess of abundance and fortune for Buddhists, and was represented on the oldest surviving stupas and cave temples of Buddhism. Lakshmi is the Hindu goddess of wealth, fortune and prosperity. She is the wife and shakti (energy) of Vishnu, a major god in Hinduism. Lakshmi is the household goddess of most Hindu families, and a favorite of women. Although she is worshiped daily, the festive month of October is Lakshmi's special month. Sahasranama is a Sanskrit term which means "a thousand names". 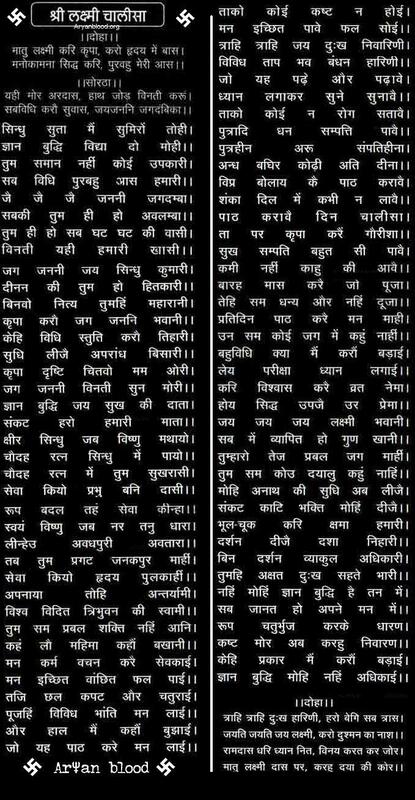 It is also a genre of stotra literature, usually found as a title of the text named after a deity, such as Vishnu Sahasranāma, wherein the deity is remembered by 1,000 names, attributes or epithets. In Hinduism, Goddess Lakshmi is worshipped in several forms. The most popular forms of Goddess Lakshmi are eight which are collectively known as Ashta Lakshmi. There are different opinions on the manifestations of Goddess Lakshmi in Ashta Lakshmi. However, following manifestations of Goddess Lakshmi are mentioned while describing the iconography of Ashta Lakshmi. In Ashta Lakshmi Stotram, composed in the 1970s by Shri U. Ve Mu Srinivasavaradacharyar, Veera Lakshmi is replaced by Dhairya Lakshmi and Aishwarya Lakshmi is replaced by Vidya Lakshmi. As per the Stotram the list of Ashta Lakshmi is as following. In Ashta Lakshmi Ashtottara Shatanamavali i.e. 108 Names of Ashta Lakshmi, the 8 forms of Ashta Lakshmi are similar to that of Ashtalakshmi Stotram but replaces Dhana Lakshmi by Aishwarya Lakshmi.